4,518 sq ft; lot: 9.54 acres - MLS# 1618641 Courtesy of Shorewest Realtors, Inc. 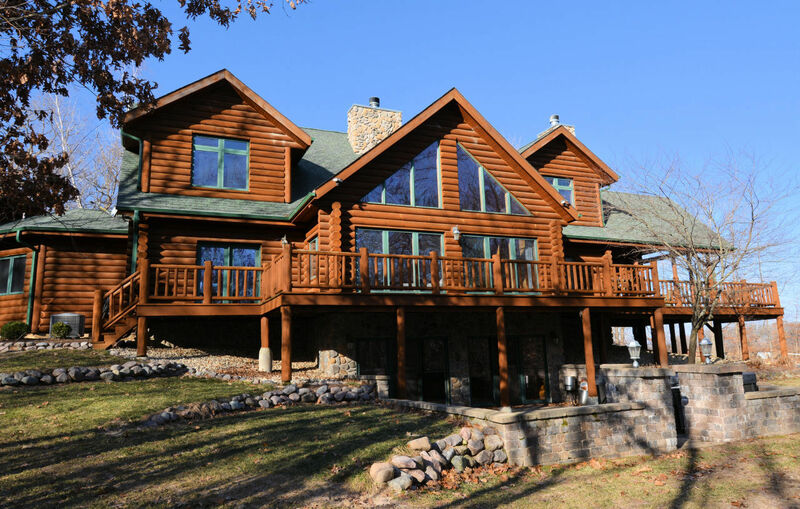 Private retreat with custom built log home on 9.5 acres w/a security gate, private stocked pond, detached 42x64 heated Morton building (w/rec room), a detached 2.5 car GA & 2.5 attached GA! This gorgeous home has a 2-story great room w/stone FP & scenic views. The KIT is a chef's delight w/granite & new BLK SS appls! First flr MBR w/totally remodeled high-end bath! Upstairs offers 3 full BRs, a loft & a full updated BA! Enjoy the outdoor FP on the wrap around deck & the newly installed above ground heated pool! Walkout finished basement w/bar, new furnace, tankless water heater, iron curtain & freshly landscaped w/LED lighting. Full basketball & sand volleyball courts, plus ATV trails, pond for fishing (bluegill, perch & bass) w/waterfall & hunting! Only 2 miles from Waukesha Cty line.